Describe report formats: tabular, summary, and matrix. There are three report formats available: Tabular, Summary, and Matrix. Tabular is the default format. * Row limit required. Learn more here. ** Bucket fields and formulas are not covered in this module. Let’s walk through building a sample report for each report format. Tabular reports are the simplest and fastest way to look at your data. Similar to a spreadsheet, they consist simply of an ordered set of fields in columns, with each matching record listed in a row. While easy to set up, they can't be used to create groups of data and there are limits to how you can use them in dashboards. Consequently, they're often best used for tasks like generating a mailing list, so when Lincoln asked Maria for a report of all open opportunities, Maria knew that a tabular report would fit the bill. Let’s help Maria build the tabular report! On Reports, click New Report, choose the ‘Opportunities’ report type, and click Continue. For the Show Me standard filter, select All opportunities and click Done. For the Opportunity Status standard filter, select Open and click Apply. For the Date Field standard filter, select Created Date and Current FY for the range and click Apply. For the fastest results, always set the smallest date range you can. If your report has to sift through a great many dates, it can take longer to show the information you’ve asked for. 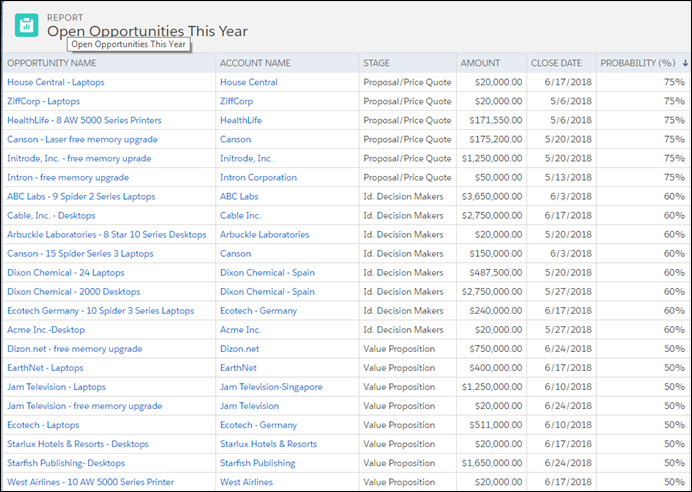 The following columns should already be included in your report: Opportunity Name, Type, Lead Source, Amount, Close Date, Next Step, Stage, Probability (%), Fiscal Period, Age, Created Date, Opportunity Owner, Owner Role, Account Name. Name your report Open Opportunities This Year. Enter a description and save the report in the Public Reports folder. Depending on which org you’re using to practice these steps, you may or may not see data in your report at runtime. Summary reports are similar to tabular reports, but also allow you to group rows of data, view subtotals, and create charts. Summary reports give us many more options for organizing the data, and are great for use in dashboards. Yes! Summary reports are the workhorses of reporting—most people find that most of their reports tend to be of this format. Roberto Alvarez, COO of Ursa Major Solar, wants to review all open customer support cases, grouped by priority. Let’s help Maria help Roberto by building a summary report. From the Reports tab, click New Report, choose the ‘Cases’ report type from the Customer Support Reports folder, and click Continue. For Show Me, select All Cases and click Apply. For Date Field, select Opened Date and All Time for the range. Then click Apply. From the Add filter... picklist, apply a field filter for cases where Open equals True. Leave the operator set to equals. From the dropdown list, select True and click Apply. Verify that these columns appear in your report: Case Owner, Subject, Date/Time Opened, Age, Open, Closed, and Account Name. If necessary, add them. To make this report a summary report, you need to group rows. To group rows, first click OUTLINE. 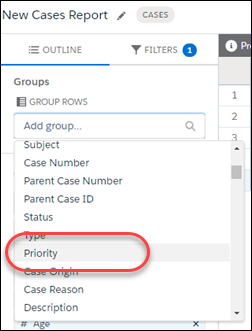 Under GROUP ROWS, from the Add group... picklist, select Priority. Turn off Detail Rows at the bottom of the preview page to see just the totals for each priority level. Save the report as Open Cases for All Time, and accept the auto-generated unique name. Enter a description, choose the Public Reports folder, and click Save. Click Detail Rows to toggle between showing and hiding columns in your summary report. Matrix reports allow you to group records both by row and by column. These reports are the most time-consuming to set up, but they also provide the most detailed view of our data. So why would you want to use a matrix report? If you’re looking for an at-a-glance overview of data, especially for something like totals of revenue or quantity of products sold, then the matrix report format is for you. To illustrate the point, let’s look at two reports, side by side. The use case here is opportunities for last fiscal quarter, grouped by close month, with the amount summarized. Which report gives you an easier at-a-glance view of the same data? Now that you’re convinced, let’s build a matrix report. Sita, the CEO, is planning for the coming year and wants to know revenue trends, month over month. Let’s start by helping Maria create the basic report. In this step, we’ll create a matrix report showing sales by type for each month. On the Reports tab, click New Report, choose the ‘Opportunities’ report type, and click Continue. For the Opportunity Status standard filter, select Closed Won and click Apply. For the Date Field standard filter, select Close Date. For Range, select Current FY. Click Apply. To summarize the report by Sum of Amount, click the More actions dropdown arrow on the Amount column. Then, click Summarize and select Sum. To change the report format to matrix, first group rows by Close Month and columns by type. To start grouping, click Outline. Under GROUP ROWS, from the Add group... picklist, select Close Month. Under GROUP COLUMNS, from the Add group... picklist, select Type. You may want to hide the report details when viewing a matrix report. Matrix reports are usually easiest to consume with details hidden. To hide the report details, turn off Detail Rows. Save your report as Opportunities by Sum of Amount and accept the auto-generated unique name.